ESPOO, Finland, April 30, 2015 (ENS) – The company behind the wildly popular computer game Angry Birds, Rovio Entertainment, is joining with the nonprofit BirdLife International in a unique campaign to protect real-life birds in the South Pacific. Like their counterparts in the game, Pacific birds are threatened by introduced predators eating their eggs and pushing them to the verge of extinction. Rovio Entertainment Ltd announced with the planned release of Angry Birds Seasons Thursday that they are entering the fight to save the most threatened birds of the Pacific from extinction. The new game will allow players to explore the story behind real birds in the Pacific and support their struggle against non-native predators. “With more than 2.8 billion downloads of Angry Birds our fans worldwide know only too well the story of the Angry Birds’ mission to protect their eggs from their mischievous nemesis, the piggies.” said Sami Lahtinen, senior vice president Games at Rovio Entertainment, based in Espoo, Finland. “It is great to be able to reflect this story with a real life situation that helps BirdLife protect and restore bird populations in the Pacific,” he said. “It’s really sobering to realize that some of the species to be saved by BirdLife have populations lower than the number of staff working at Rovio Entertainment,” said Lahtinen. Humans have introduced non-native species such as rats to Pacific islands, causing the extinction of half of all bird species in the Pacific. BirdLife says 81 Pacific bird species are threatened with extinction today. To save their bird populations and other wildlife, BirdLife and its partners have restored more than 30 islands in five Pacific countries: the Cook Islands, Fiji, French Polynesia, New Caledonia and Palau. 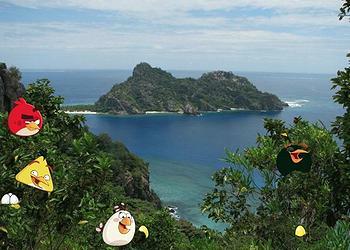 Now, with the support from Rovio and the crowd, and run with positive impact platform kriticalmass, BirdLife is seeking to raise $150,000 for island restoration in French Polynesia. The work in French Polynesia will target islands with populations of critically endangered birds. 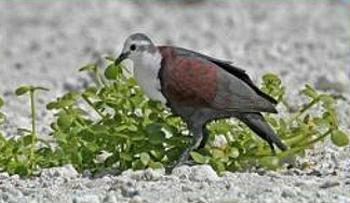 Species like the Polynesian Ground-dove, Gallicolumba erythroptera, now reduced to fewer than 100 birds, will be given a better chance of survival. In the Angry Birds Season Tropigal Paradise update, gamers can learn about the threats to real-life birds in the Pacific and support work that ensures their survival. As in the game, Rovio and BirdLife are turning to the crowd to help defeat the predators that are stealing bird eggs and threatening their existence. On www.kriticalmass.com/p/savepacificbirds users can hear and share the story and also volunteer, donate money or buy rewards to help save the birds in the Pacific. The campaign went live Thursday on www.kriticalmass.com/p/savepacificbirds along with the release of Angry Birds Seasons on Apple App Store and Google Play. BirdLife is also seeking additional support for its longer-term plans to save species from extinction across the Pacific. “Over the past decade BirdLife International has become expert at removing non-native predators from Pacific islands,” said Patricia Zurita, BirdLife’s CEO. “With more funding we can make a huge difference to more tropical islands and restore them back to their original paradise and help the local bird populations and other species thrive. Zurita says local communities benefit from better crop yields when non-native predators are removed.